Built in 1890-91, the historic Ralph Connor Memorial United Church was named, in 1942, for its founder and first minister, Charles W. Gordon, who wrote popular stories and novels under the pen name, Ralph Connor. The Rev. 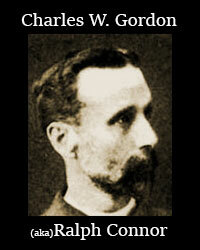 Dr. Charles Gordon was a Presbyterian missionary assigned to cover the territory around Banff. When he arrived, Canmore was a burgeoning railway divisional point and coal mining centre without a church. When he departed about three years later, the Canmore Presbyterian Church had been established and the present sanctuary built. 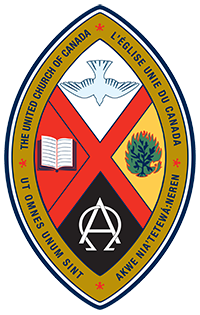 In 1925 the congregation became part of a new, truly Canadian denomination, the United Church of Canada. In 1898, while Dr. Gordon was serving as the minister of St. Stephen’s Church in Winnipeg, his first novel, Black Rock, was published. It was the first of approximately thirty novels which catapulted him to international fame as a literary figure.It is reported that his novels sold a total of 3 million copies! Many of his stories drew heavily from his colourful life as a frontier missionary. He also wrote a biography of the Rev. James Robertson, and his own autobiography. Dr. Charles W. Gordon went on to win acclaim in a number of fields of activity. As a front line chaplain during World War I, as a diplomatic emissary representing the allied cause in the United States, as a labour mediator, as a champion of women’s rights and as an active proponent of the formation of both the United Church of Canada and the League of Nations (precursor to the United Nations), he worked tirelessly for harmony amongst his fellow men and women. However, his greatest love was always the Church, which he served to his dying day. 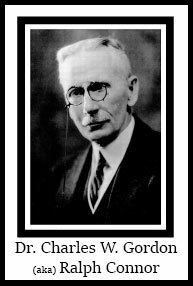 On October 31, 1937, Charles Gordon died, but through the writings of Ralph Connor, his spirit lives on. Gordon United Church in Victoria, BC, is also named for him. The Church which he founded in Canmore also lives on. It has experienced the changes of time and fortune as have the towns of the Bow Valley which it serves. Ministers representing the Presbyterian Church and, after 1925, the United Church of Canada, have come and gone but the church remains, helping to keep the gospel of Jesus Christ alive in the Bow Valley and in the world. On January 25, 2016, the Church celebrated its 125th birthday! See Wikipedia for more information about the life and writings of Ralph Connor. Charles W. Gordon wrote over 35 novels under his pen name of Ralph Connor. Visit our “Books” page for the full list.